Jiffy Trucks have revolutionised the way caterers carry out their deliveries for hot & cold food, and provided them with the ability to serve freshly cooked produce to customers on-the-go. The specially designed catering vehicles allow businesses to adapt to the needs of their customers, with workers who are in need of quick service on their lunch break and aren’t necessarily located with shops in easy reach. Successful mobile catering businesses commend the Jiffy Trucks on their versatility and ability to be much more flexible with their offerings than they would with a fixed premises, in the way they can easily re-locate to places where there’s more demand in the market i.e. new offices opening or the development of a new industrial estate. Not only that, but it provides easy access to events or food festivals as a way of increasing reach and maximising profits. It’s generally a win-win! 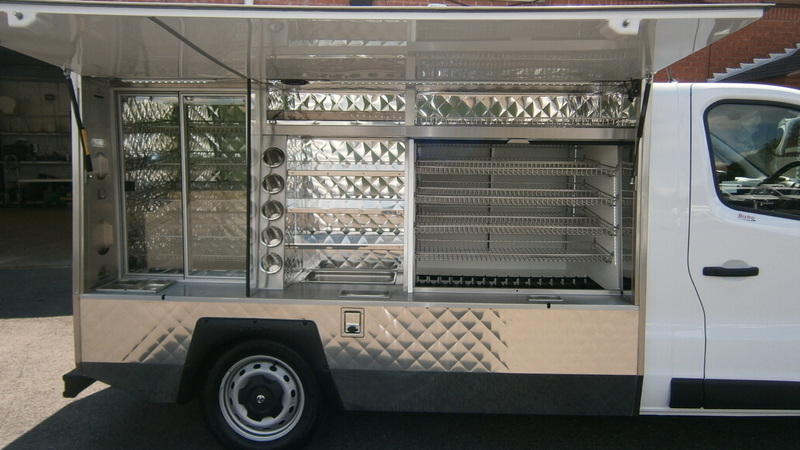 The unique requirements of hot and cold catering present the need to take into account proper hygiene, temperature control, storage, safety and security – all features which Jiffy have nailed down over the years, with their unique truck designs pushing them to become market leaders. 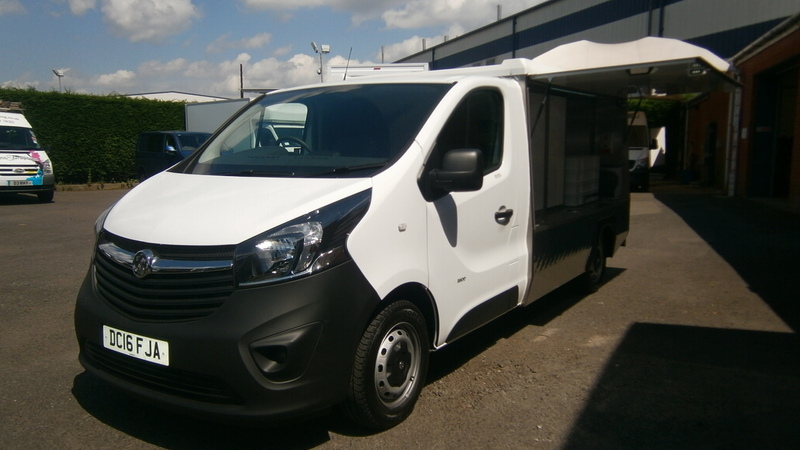 The Jiffy Bistro van is one of our offerings here at Cool Running Rental, making it accessible to customers who don’t necessarily see it viable to purchase and own their very own. Of all the Jiffy vans available, why did we opt to go for the Bistro? Well, we’d argue that this one tends to be the most sought after Jiffy of the lot (in our own personal experience, anyway) as it’s a good size, not too big or too small, and has everything you need to take your catering on the road. What’s so good about the Jiffy Bistro? There’s more than meets the eye with the Jiffy Bistro, it’s packed with features handy features and essential tools to ensure that your catering jobs go as smoothly as possible. It’s much more than a temperature controlled vehicle, and actually packs in a whole bistro within its loadspace. From the exterior, it doesn’t look much more than your typical delivery van. Open it up, and you’ve instantly got fresh, hot meals on wheels – though much more modern and presentable than your standard funfair burger van. The layout of the Jiffy Bistro is second to none, with a self-service system that runs like clockwork. In a similar way you would approach a fresh bakery in a supermarket or a hot food area in a canteen-style eatery, customers can serve themselves from the fridges and ambient areas inside the the truck. This makes it easier for the customer to view all of their options and make a quick selection to make way for the next person, and so on. The fridges are constructed from thermally efficient grp panels, which are easily cleaned and help to keep the temperature cool and fresh. The fridges house removable stainless steel baskets, and a spring drinks holder in the bottom. The ambient areas have clear fronted shelving, and are perfect for displaying smaller goods, with additional full size bain marie in the base, perfect for the storage of bread buns. The heated areas are perfect for freshly baked goods, pies, hot sandwiches etc, displayed behind double glazed glass display doors. This is also usually the area where the customer would be greeted by the operator to take their money, with a money safe, bag and handy napkin holder built into the wall in this part of the van. There’s ample storage room on the back end of the display section, with various baskets and trays to store all of your produce for transportation. Chilled baskets allow you to keep perishables at adequate temperatures, and storage tray facilities are available in both chilled and ambient sections, which is ideal when travelling from one location to another, or delivering goods as part of a buffet catering job. Of course, hygiene is highly important when handling food and serving the public, so Jiffy has all bases covered here by providing a warm water hand wash near the storage units. Fancy branching out into the mobile catering industry? Or been eyeing up a food festival/market you’re keen to attend to make a bit more cash? In both instances, hiring or renting a catering van is the perfect solution. Jumping straight in and purchasing one is a big investment, and one which might not necessarily pay itself off for a while, if at all. After all, if you’re just starting out you never know how successful it could be, and you risk being out of pocket burdened with a van that may be unnecessary. That’s why we always encourage small businesses to give it a go with a flexible rental solutions first. 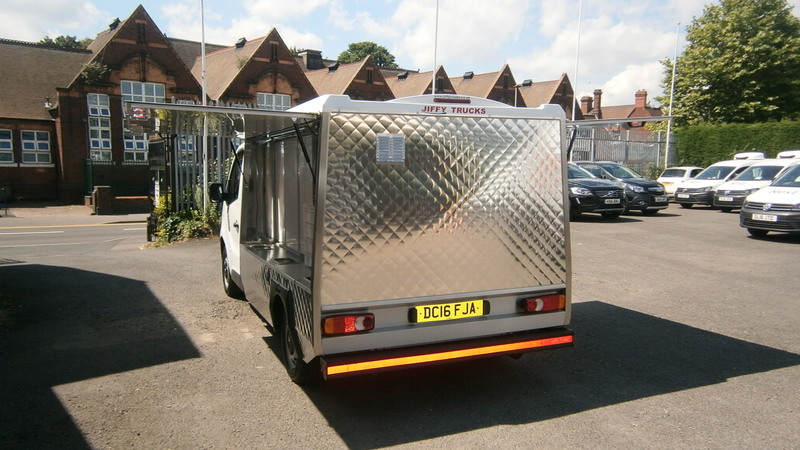 Our Jiffy Bistro vans are available for short, medium and long-term rental, hire and leasing. The flexibility of our deals means you can choose a time frame that best suits your requirements and budget. All of the vehicles from our rental fleet are late model, and fully serviced & valeted before rented out so you can be safe in the knowledge that they are in great working condition. However, if an unexpected problem was to occur, we provide full breakdown cover so you don’t need to worry about the added expense of that. Get in touch with us to find out more, and our friendly team will be happy to answer any questions and create your free quote.